Transport ministers from across Europe and the Globe came together at the 70th anniversary session of UNECE’s Inland Transport Committee (ITC) to sign a ministerial resolution, which not only recognizes the 70 years of accomplishments of ITC but also commits to continuing to support the Committee in the future. The purpose of this anniversary session was to not only take stock of ITC’s past contributions to inland transport but also to decide on its future mission until 2030 at a time of profound changes, challenges and opportunities globally. The meeting involved more than 500 representatives from 89 countries across the globe. The committee this year concluded with a number of important decisions that will affect the future of inland transport, including endorsing the resolution on “Embracing the new era for sustainable inland transport and mobility.” The resolution had been signed by 58 countries and the European Commissioner for Mobility and Transport at the end of the ministerial meeting held on 21 February. 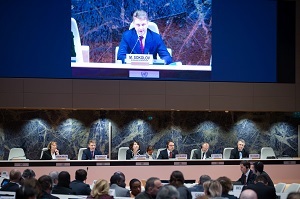 The resolution is intended to convey the appreciation of the highest level of the constituency of ITC for the 70 years of the Committee’s and its subsidiary bodies’ work as well as to encourage the ITC to continue producing outputs for the existing mandates. Most importantly, the resolution provides a collective affirmation of the relevance of the Committee for the advancement of the Sustainable Development Agenda through paving the way toward sustainable inland transport and mobility, and will ensure that it will be in a position to deliver a strong message and presence for the future inland transport we want. For 70 years the ITC has been continuously working with governments, industry and policy makers to promote sustainable transport which is safe, clean and competitive, through the development of freight and personal mobility by inland transport modes, by improving traffic safety, environmental performance, energy efficiency, inland transport security and efficient service provision in the transport sector. By now the ITC has become center for UN conventions on inland transport. The ministerial meeting was opened by Mr. Maxim Sokolov, Minister of Transport of the Russian Federation. In his keynote address, H.E. Mr. Didier Chambovey, Ambassador, who spoke on behalf of H.E. Ms. Doris Leuthard, President of the Swiss Confederation, stressed the importance of the ITC, saying that connectivity through transport and trade leads to stability of economies, countries and societies. The work of the ITC helps bring about that stability. Following the opening address where three panels focusing on the role ITC plays and can play in the future in creating sustainable safe interconnected transport. The second panel was entitled “ITC – Platform to link regulators and innovators: technologies for sustainable mobility” and explored policy responses to technological changes and the conditions for creating a conducive environment for innovations, as well as how ITC can facilitate the transition. Panelists, including Ms. Violeta Bulc, European Commissioner for Mobility and Transport, Ms. Anna Johansson, Minister of Infrastructure of Sweden, Mr. François Bellot, Minister for Mobility of Belgium, highlighted ITC’s role as the central place for the governance of inland transport and for paving the way to automated and connected vehicles. Mr. Volodymyr Omelyan, Minister of Infrastructure of Ukraine stressed the importance of intelligent infrastructure. The third panel was entitled “ITC – the Centre of UN Transport Conventions: the benefits of internationally harmonized regulatory governance for inland transport” and was moderated by Ms Eva Molnar, Director, Sustainable Transport Division, UNECE. The panel highlighted experiences from countries with the highest number of accessions to the UN transport conventions which are under the purview of the ITC, and countries that have recently become Contracting Parties. It featured as speakers, Mr. Zhamshitbek Kalilov, Minister of Transport of Kyrgyzstan, Mr. Anis Ghedira, Minister of Transport of Tunisia, Mr. Rotimi Amaechi, Hon. Minister of Transportation of the Federal Republic of Nigeria , Mr. Aleksey Avramenko, First Deputy Minister of Transport and Communications of Belarus, Mr. Luis Aguilera Ruiz, Secretary of State, Ministry of Interior of Spain, and Mr Jean Todt, UN SG Special Envoy for Road Safety. This year’s annual meeting also featured a number of side events including the 2017 Global Road Safety Film Festival where UNECE teamed with LIFE and Hollywood filmmakers to highlight short film on road safety. There was also an exhibition that featured a 70 year timeline of the ITC and the world at large showing how the ITC, technology, and society had progressed over the last 70 years, and the accomplishments that had been made.